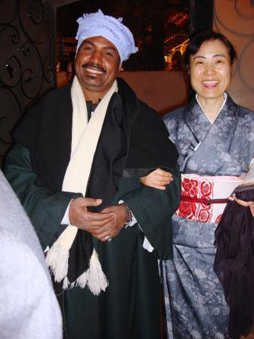 Kazko Kawai visited Cairo over the new year 2011, when no local person was talking about revolutions. It all happened after she left Cairo and after the fall of the Ben Ali regime. Kazko attended many concerts there. Here are the most traditionally dressed audience members in Amthal's concert at El-Sawy – an Egyptian man and herself. 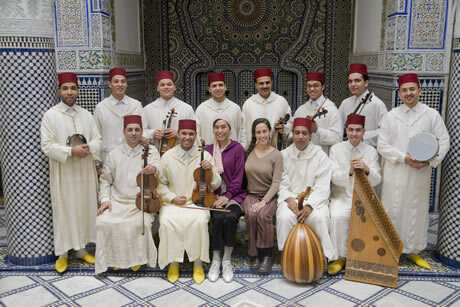 The Orchestra of Tetouan arrived in JFK from Morocco. On the following day, they headed for the WNYC radio station in Soho to be featured in John Schaffer's New Sounds on WNYC. Here, the members started a sound-check. It was a Ramadan day, and the musicians were fasting until the sunset. They flew to Milwaukee to start their first US tour in Madison, Wisconsin. 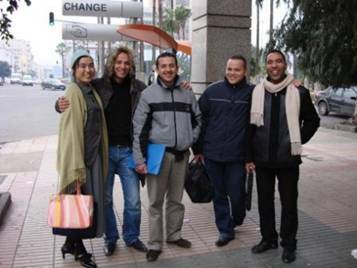 On December 30, 2008, the members of Orchestra Otmani of Fes went to the US consulate in Casablanca for the visa interviews on their second try. All of them got turned away on their first attempt earlier that month for no reason. Without help from Congressman Jerry Nadler’s office in New York, the cultural affairs department of the US embassy in Rabat and our immigration lawyer, they would not have any visa granted. Five out of the seven members who went to the interview on this day were granted visas on the following day, and the remaining two in two weeks. Here, Kazko and several members are standing in front of a BMCI Bank branch across the street from the Casa de Voyageur railway station before heading for the consulate. Mohammed Otmani is paying the interview fees ($131 per person) at the bank. These interview fees are on top of the visa petition fee, the immigration lawyer’s fee and other related expenses. 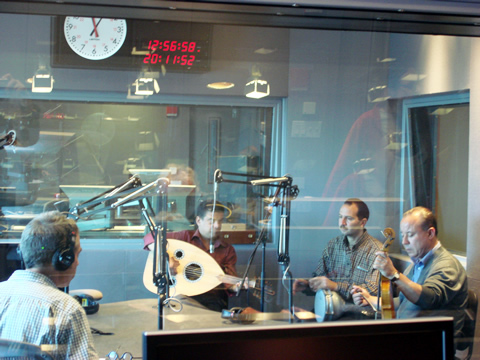 The Otmani group was interviewed by various media while in the USA. Left: “Global Village” show at KPFK, Los Angeles, hosted by John Schneider. 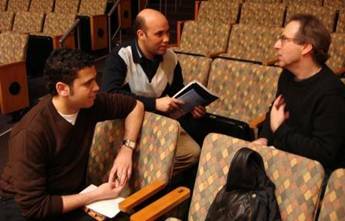 Right: Mohammed Otmani and Marouane Hajji are interviewed before the LA concert by Steve Hochman for AOL Spinner. The Otmani group went out to explore New York City by taking the subways. 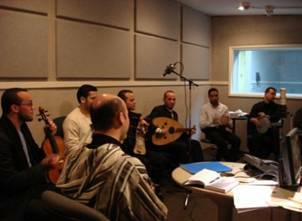 Otmani group visited Columbia University’s WKCR while in New York. After this recording, Mohammed Otmani and Marouane Hajji went to CUNY Graduate Center on Fifth Avenue to give a lecture/presentation to a packed audience. Kazko Kawai took Sarah Skinner and Kevin Fox of WeClick.com to Tangier, Tetouan and Fes for photo and video shoots with musicians. Here are Sarah and Kazko with the full Orchestra Otmani of Fes in the beautiful Museum of Andalusian Music in the Old Medina of Fes after long hours of photo and video shoots. 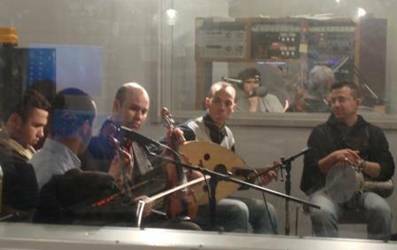 We expected Tangier Ensemble with five musicians for the 4-city tour. 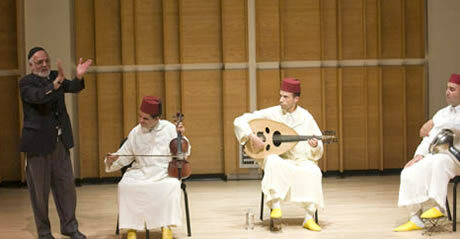 But only three of them obtained visas by their departure date, making the ensemble "the Tangier Trio." In the final concert in New York, we had a surprise guest in the audience - the famous Rabbi Haim Louk, who studied Andalusian music with Cheqara in Tetouan, Tangier's twin city. The Rabbi graciously agreed to participate in the performance from his seat in the second part. For an encore, the Rabbi went up on stage to join the musicians. 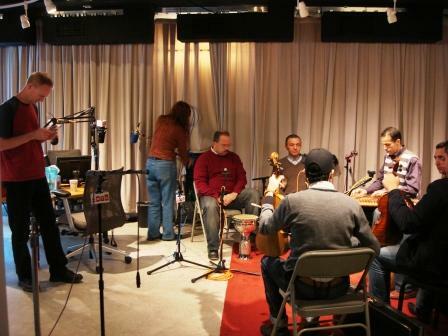 On Sept 12, 2007, Ben Allal, Arabi-Serghini and Al-Ghazi went to WGBH in Boston to be interviewed for NPR. "The World" radio show was hosted by Marco Werman. To listen, click here. After a regular concert at CUNY Graduate Center on Sept 14, the orchestra had one more show in New York. 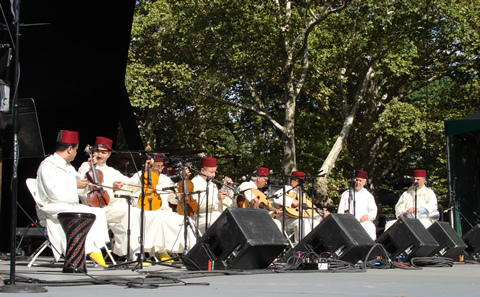 On Sunday, Sept 16, the orchestra participated in "Music around the Mediterranean Festival" in Central Park Summer Stage along with musicians from Spain, Greece, etc. It was a very hot day in Ramadan... After the appearance, the musicians flew from JFK to O'Hare. On Monday, Sept 17, the orchestra's performance was broadcast live on a national TV show, "Noon Show," to represent the artists of Chicago World Music Festival. 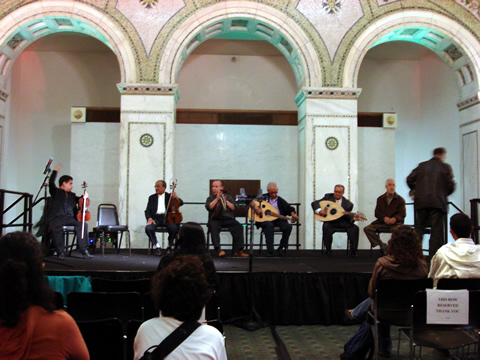 After the TV show, the orchestra went to the Chicago Cultural Center for the final concert in the USA. The members are rehearsing in this photograph. Surprisingly, many audience members were already waiting in the auditorium. The concert was far more than a full house, and 600 people were turned away at the door. 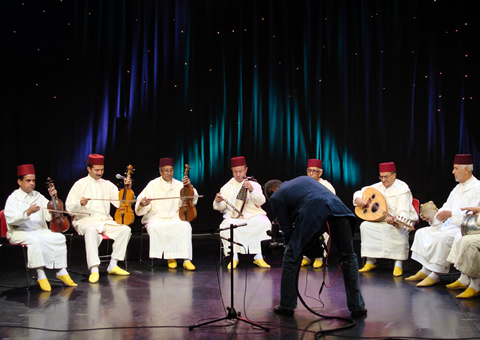 The musicians left the USA for Morocco on the following day with big smiles.